For those super hot days, nothing beats a refreshing watermelon salad with feta. Interesting combination but unbeatable, as it is both savoury and refreshing. It’s easy and quick to prepare and makes for a great salad to accompany a BBQ. There are many different variations of this salad, as seen in restaurants and on the web, sometimes it’s served with mint instead of basil, and olives and onions are even added to the mix, but I like to keep it simple as I find the olives and onions can overpower the watermelon. However don’t scrimp on the ingredients, try to get the best feta you can find, not Canadian feta but Greek feta, and even better if you can get your hands on the goat feta, also use the best olive oil you have and choose the pinkest watermelon possible! No need to prepare this in advance as it only takes 5 minutes to assemble! Cut one slice of the watermelon and cube it and assemble on a plate by keeping same shape as slice. 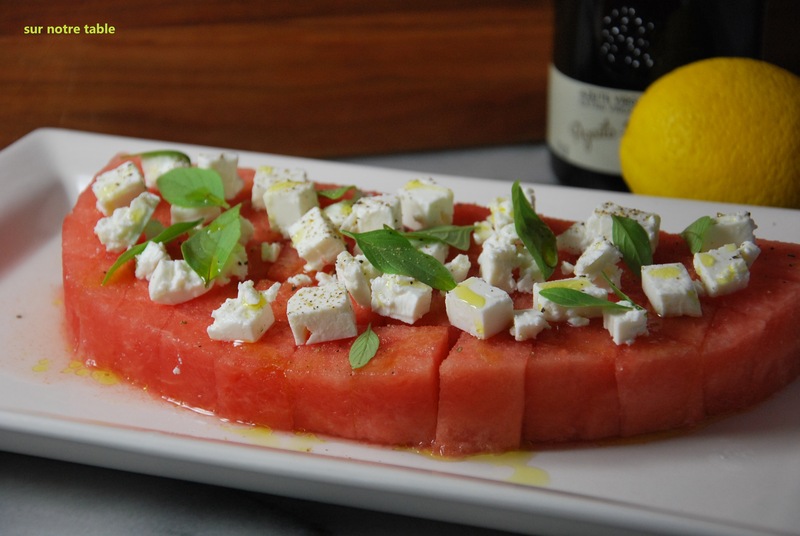 Sprinkle cubed Greek feta overtop watermelon. Sprinkle basil leaves and then drizzle olive oil overtop. Squeeze lemon juice from 1/2 lemon and grind fresh black pepper over salad. Voila, that’s it. Simple, easy and refreshing! 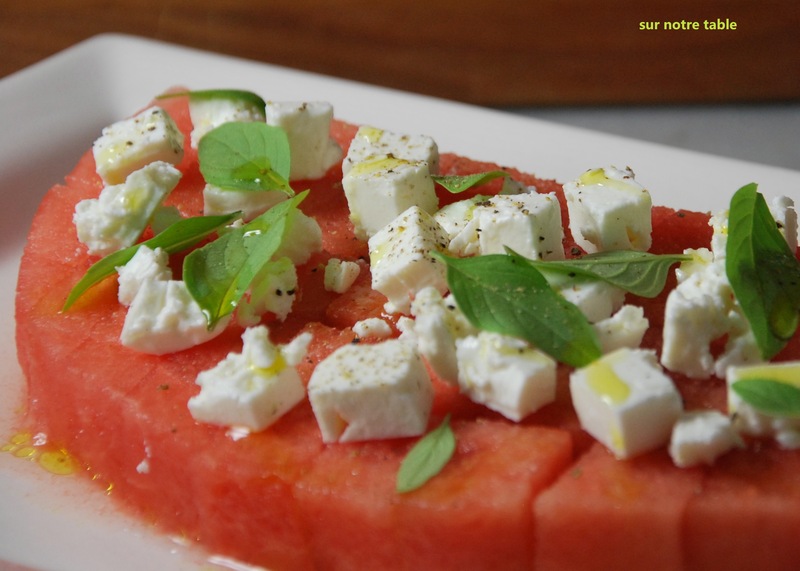 This entry was posted in Appetizer, Easy, salad, Uncategorized, Vegetarian and tagged appetizer, easy, fast, greek feta, salad, seasonal menus, watermelon by Caroline Reny. Bookmark the permalink.